TrainStation is the most popular train simulation game in the world. This is the story behind its mobile app which reached 2 million downloads in 4 months. 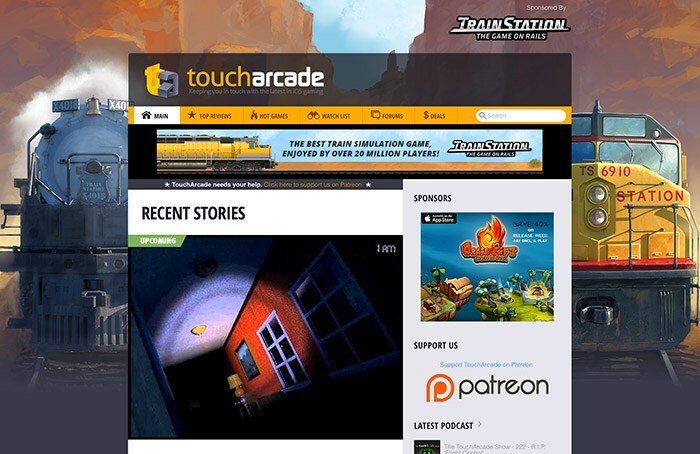 TrainStation – The Game on Rails is a veteran in our portfolio. The game is 5 years old and have been already played by more than 20 million people on the web. It was originally made for Facebook. Throughout the history, it attracted millions of players and acquired a huge community of railroad enthusiasts. Few expected the game to survive this long. It is still very strong on the web but we somehow felt our audience shrinks everyday. We had to go mobile. It took almost a year and a half to publish the mobile app since the web version was made in Flash and we basically had to rebuild client and server from a scratch. It was well worth it. 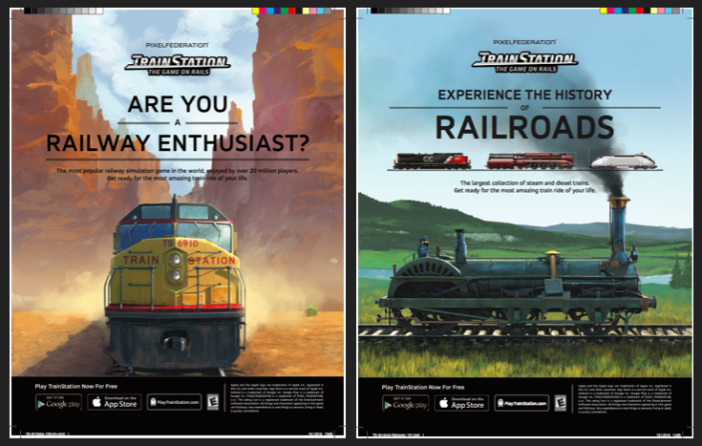 Over 75% of players we acquired on iOS and Android had never played TrainStation before. We reached a whole new audience and our revenues went up 80%, setting an all-time revenue record for the game in October. Yep, a revenue record for a 5-year old game. Monthly revenue chart for the mobile version of TrainStation. iOS is green and Android is orange. We built the game for tablets at first because it was much more convenient. TrainStation is a complex game with tons of content so it was much easier to develop for an iPad. The very first iPad version was released in January 2015 in Canada, Australia, New Zealand, Slovakia and Czech Republic. Pretty much the usual soft launch stuff except Slovakia and Czech Republic which we have chosen because we are based in Slovakia and we have an extraordinary community in both countries. The decision was to went for the iOS first because the platform is more uniform which allowed us to focus clearly on testing and tweaking. In the chart below you can see daily downloads during the first soft launch phase. We averaged 100 downloads a day from CA, AU, NZ, SK and CZ. The small peak in the middle of the February was caused by a small promotion targeted towards those countries on our own Facebook Page. It was enough enough traffic for a basic testing though. TrainStation daily downloads on iPads during the soft launch phase. The iPad version was released worldwide in the middle of the March. Still no big marketing, all peaks in the chart were caused by promotions towards an existing community that played the web version of the game before. Besides those peaks, we averaged 300 downloads a day. In April, we released a version for Android tablets. The initial peak was caused by our own web community, afterwards we averaged 700 downloads a day. 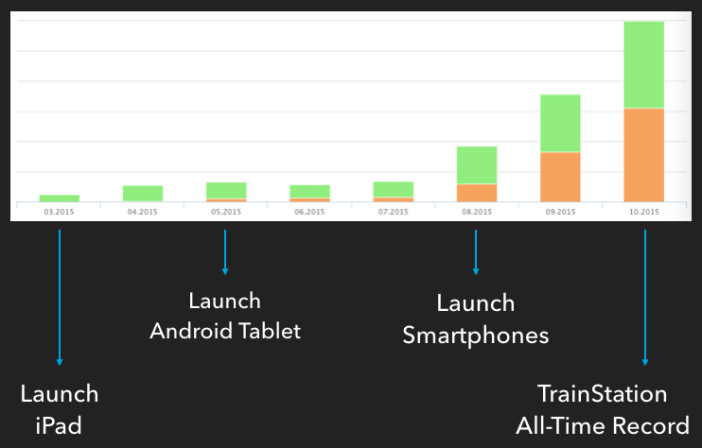 TrainStation daily downloads on Android tablets during the soft launch phase. The reason why it took so long to release a smartphone version was that we decided to build a completely new user interface for smaller screen sizes. As I said, the game is very complex and there are tons of content (e.g. over 1500 locomotives) so we basically sacrificed few months for a much better user experience on smartphones. Mentally, we were still in a kind of a soft launch state even the game was available worldwide. Tablet market is much smaller in comparison to a smartphone one and we wanted a full synergy for our marketing efforts. Meanwhile, we prepared a new UI, improved various KPIs and tested essential tracking tools. We also tried ad networks using small budgets and played with ASO to boost the traffic. To verify basic KPIs for retention and monetization. To set up a proper tracking and implement various SDKs. To test different marketing creatives and ad networks. Retention and monetization is for another article. Regarding tracking and SDKs, we have a kind of complicated ecosystem with our own in-house solution to measure everything from installs to in-game events and player behaviour. Since the game has a Facebook integration and we spend a lot of money on Facebook Ads, a native Facebook SDK is a must have. We also use Appsflyer to attribute installs. Since we didn’t do any extensive marketing activities during the soft launch and TrainStation is kind of a niche game we only had around 7,000 daily active users on iPads and 10,000 on Android tablets. 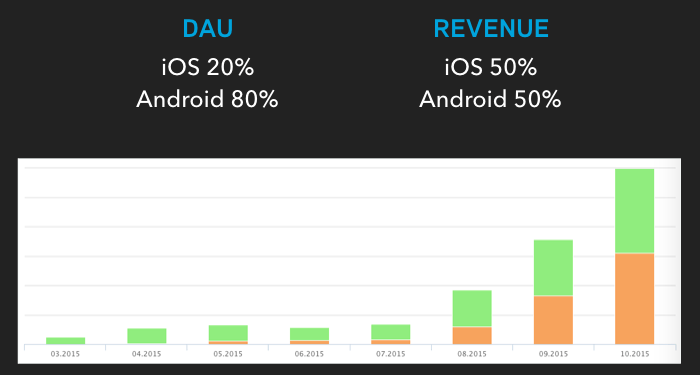 Revenues were highly in favour of the iOS, see the chart below. The reason is much better monetization per organic user on the iOS. TrainStation mobile app revenues, May to July 2015. Green stands for iPads, black for Android tablets. The game was fully launched on August 10th when we released a smartphone version and started with marketing activities. Our goal was to get a maximum synergy from all possible channels – to get as many quality downloads as possible by using both paid and free marketing channels. To achieve that, we had to pick few countries where we could effectively leverage the power of our own community whilst getting additional boost from various paid channels. Even though we had a really strong community in the United States, we decided to avoid all paid marketing activities for a first week there. The reason being, the US market is so saturated you need to invest a huge amount of money to have a real impact on launch. What are the best performing countries for TrainStation on the web? How many active players do we have in these countries? How much revenue do they generate? How big is the iOS market in these countries? How many downloads you need to get into TOP10 in each country? Then we made a huge Excel sheet with all the data. The best performing countries on the web were easy since we just looked at our DAU and revenue charts from the web version. However, the number of active web players is one thing and the potential of those players on a mobile platform another. We needed to know how many of those active web players we could truly reach on mobile. We used a little hack. We exported Facebook IDs/Emails of our existing active players from Facebook/Web in CSV file and imported them into the Power Editor as Custom Audiences. Then we simulated a new iOS/Android campaign on Facebook using those Custom Audiences. For example, we had a CSV file containing IDs of all web players from Germany who are at least level 15 and were active in the game at least two times in the last month. Then we created a Custom Audience and simulated a new campaign in Power Editor. Target country was Germany, target platforms iOS & Android. Then we looked on estimated reach and saw an approximate number of our active web players using mobile devices in Germany. We actually didn’t create a real campaign towards our active players since we were able to reach them for free directly in the web version of the game and via social media. Later on, we ran mobile re-engagement campaigns on Facebook targeted towards inactive players who used to enjoy web version of TrainStation – indeed many of them returned because now they were able play on their smartphones. Nevertheless, after doing this we picked 10 countries with the biggest potential. Then we looked at data from App Annie Business Intelligence and checked how many downloads we need to get to break into TOP10 Overall in these countries. We also looked on a total volume of each market since countries as Luxembourg are cool but overall reach is very limited. Finally, we picked Germany, France, Netherlands, Belgium and Denmark as markets for an initial paid marketing push during the first week of our launch. First of all, we notified our existing user base on the web by a big in-game announcement as well as by social media. We also sent an email newsletter to our most engaged players. Obviously, we did this globally. Then we added paid marketing channels into the mix in previously selected countries. We launched Facebook and Chartboost campaigns there to maximize our impact. After few days, we slowly started adding other countries, including the US. This way, we were able to reach top charts on iPad and decent positions on iPhone and Android in few countries which brought us additional organic traffic for free. This is how it looked back in August. Overtime, our DAU increased from 7,000 on iOS and 10,000 on Android to 25,000 on iOS and 90,000 on Android as by today. You can see what our launch strategy did on 10th of August. TrainStation Daily Active Users. Orange is Android, Blue/Yellow is iOS. Regarding revenue, both platforms are basically equal. We all know that iOS can monetize much better but thanks to the traffic volume on Android the revenue will eventually equalize. TrainStation Daily Active Users vs Revenue. Bottom chart is a revenue split between two platforms, iOS is green. Android revenue (orange) eventually caught up because of much more active users. Since the soft launch phase until today we continuously played with the ASO. If you’re not familiar with the process of the App Store Optimization you can learn more here. After the initial peak our daily organic installs dropped to 700 units on iOS and 6,000 units on Android. However, we managed to increase this number over the time and today we have around 1,600 daily organic downloads on iOS and 11,000 on Android. It really doesn’t matter which ASO tool you choose, most of them are very similar. What’s really important is your strategy. There is really no science, all of them are pretty straight-forward. In the process, our Google Play description grew from 1,200 characters to more than 3,000. App description is now also localized into more than 20 languages. First, genre keywords means we focus on simulation / tycoon / building keywords. There are always tons of different genre keywords so you need to experiment. Furthermore, optimizing for search phrases is a whole new process but it definitely pays off. Second, niche keywords are really simple. We are a train game so those people who love trains must be able to find us. Usually, niche keywords are combined with genre keywords into phrases so we had to experiment a little. Third, competition was our last target. There are some specific tycoon games, simulators or train driving titles which we target based on their popularity and similarity. Performance marketing is our strongest tool of paid user acquisition. We tried many different networks and providers but 80% of our budgets are now being spent on Facebook. The rest is mix of other big networks as Chartboost or Google AdWords. We usually spent around 250,000 USD a month on Facebook ads for TrainStation. There are hundreds of campaigns that have to be managed on a daily basis, including weekends. Thankfully, we have a very capable performance marketing team. Some of our Facebook campaigns from October. Note that every campaign has its own unique ID that we use to track players in the game. We heavily use lookalikes. Doing Facebook mobile ads is a long run process. You need to perfect your tracking and take advantage of many features Facebook has to offer – custom audiences, lookalikes, audience network, etc. We have many years of experience with Facebook advertising so our campaigns were basically profitable from the start. We started with CPI around $3.5 in August and by regular use of lookalike audiences we lowered the average CPI to $1,4 in tier1 countries such as US or DE. We did a week-long branding campaign on TouchArcade and PocketGamer. We basically bought all the available inventory on TouchArcade and the iOS section on PocketGamer, including ad space in their mobile apps. Results were kind of disappointing. We had 6 different placements on TouchArcade and few less on PocketGamer. In total, campaign generated less than 1,000 direct downloads that were tracked via to Appsflyer – mostly clicks from their mobile websites and apps. On the other hand, we are not able to measure overall impact of branding and how many installs were generated by reading a site on a computer and then searching for the app on the App Store. We didn’t see any significant peaks in organic downloads during that time though. What? A print ad for a mobile app? Yep, we did it and it worked really well. All because our game niche nicely overlaps with the real world. Our best players are train enthusiasts. Railways are their true passion. They build models of trains, they take photos of trains… and they read about trains. Therefore, we picked three niche US print magazines about trains – one about a classic era of railways, second about modern trains and third about a railroad modelling. In addition, we had premium posts in their weekly newsletters for two months. Two of our print ads. Each ad had a different copy and visual targeted to their respective audience. We tracked over 5,000 direct installs only from newsletters – and those were only emails opened on mobile devices. The cost of them was much less than ads on TouchArcade or PocketGamer. Again, we can’t precisely measure the branding effect and installs from people who saw a print ad and then decided to install TrainStation on their phone. However, this was a part of our marketing push in the United States and we saw results. Organic installs and revenue went up. We even had our existing players writing to us that they saw our ad in their favourite print magazine. We did hit our target audience for sure. We ran a week-long TV campaign in Germany, Austria and Switzerland. Below is our television spot with a german voiceover that was aired. Over a week, TV spot generated over 40,000 downloads. I obviously can’t disclose the price, but the CPI was very competitive thanks to the total volume of traffic. We went a little bit too far with this video. Some people were disappointed after seeing the 3D commercial and then logging into a 2D game. On the other hand, we acquired many quality players as well. TV spot also generated a nice chart effect as we entered top charts on iPhone, iPad and Android in Germany. That brought us additional downloads. TrainStation’s chart position, iPhone. Peak is caused by the TV commercial. Red line is Games category, blue and yellow are Simulation Games and Family Games sub-categories. We are definitely going to do a TV campaign again in the future but we have to tweak some details since we learned valuable lessons during that week. We did a partnership with a central European railway and bus transportation company called Regiojet. It was a mutual cooperation and there were no money involved. 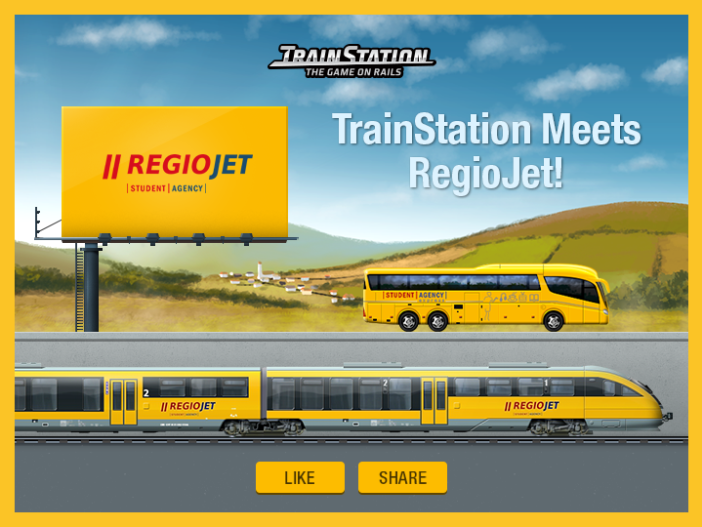 Every week, there is a new content update in TrainStation so we added branded Regiojet trains and buses into the game. Our existing players from central Europe indeed loved that because Regiojet is a popular brand there. We also promoted this limited offer via our social media channels to impact more people. On the other side, Regiojet aired our TV commercial in all their trains and buses for a one month with a reach of hundreds of thousands people. In addition, they published an article about us in their on-board magazine. Some of the unique Regiojet branded content in TrainStation. And that’s all for now. We plan to release the game on the Amazon App Store just before the Holidays. There are also some big improvements coming out soon – redesigned login screen, new retention mechanics, etc. And of course, we have new games planned for the next year. If you have any questions, feel free to ask in the comment section below!